With the help of Folgers coffee products, Eccellente Gourmet Coffee has mastered every aspect of the "specialty coffee" business so that you can profit from this $18 billion+ industry immediately. Investment starts at under $20K. Prime locations are still available on a first call basis. Complete the short form below for more information. Specialty coffee is big money, and now you too can cash in your very own business! The most innovative specialty coffee franchise opportunity of the millennium, Eccellente Gourmet Coffee provides an opportunity for any individual to jump into the multi-billion dollar coffee industry without any experience. 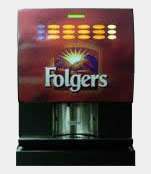 We are the only "specialty coffee" franchise business offering Folgers coffee products and equipment. Folgers (a Procter & Gamble company)is one of the world's largest coffee companies, bringing you quality products and unparalleled customer satisfaction. No other competitor can match our expertise and experience in this very lucrative business. Our program is simple. We have years of extensive research behind us, and only use the quality and reliability of Folgers - no substitute, EVER! Coffee is the second largest commodity in the world, after oil? The coffee industry employs over 20 million people worldwide? Capitalize today on the greatest idea since the invention of Espresso! A brand you know and trust - Folgers. Products you love! Coffee, Cappuccino, Mocha and Latte! A business you can run from the comfort of your home, part-time or full-time. Disclaimer: Eccellente Gourmet Coffee, Inc. is a private Corporation, not affiliated to or representing Folgers in this offer. Folgers is a trademark of Procter & Gamble. To learn more about Eccellente Gourmet Coffee business opportunity, simply complete the form below.